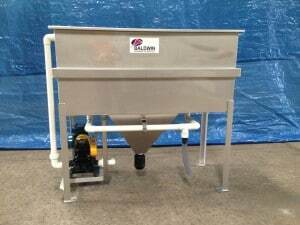 Solution: Baldwin Oil Water Separators are widely used in applications involving waste water containing flammable hydrocarbons. The customer requirement for this project was an oil water separator with an ExD rated diaphragm feed pump, that would enable an efficient installation on site. The oil water separator was pre-plumbed in the Baldwin workshop, enabling the installation contractor to simply locate the unit in position and plumb the oily water to the oil water separator and the treated water away from the separator. These pre-plumbed oil water separators are regularly provided by Baldwin to allow customers to minimise oil water separator installation time and complexity, allowing them to be up and operating faster.